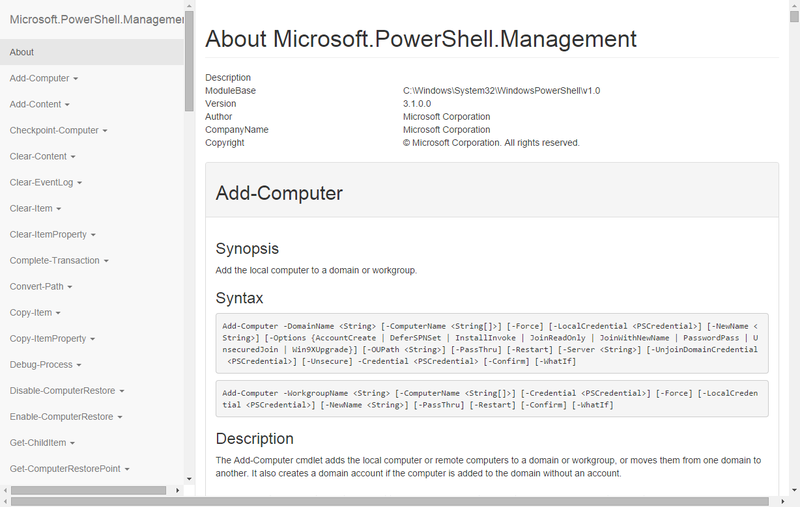 Are you a PowerShell toolmaker, and create your own modules? Have you ever wanted to create a help document to distribute together with it? Look no further. This function will read all commands from a module, extract all the necessary data and write a nicely formatted HTML document with all the help information your users need from your commands. It relies on Twitter Bootstrap with the nice Jasny-bootstrap add-on, and jQuery to create a beautiful and easy to use help document. Head on over to my github repository and check it out. And don’t hesitate to let me know how you like it (or dislike it). Even better if you fork it, and help me make it even better!